The cold weather showed up! We were still wearing shorts and flip flops last week. Let me tell you, when that cold air hit my legs this morning on the way to the gym at 5am to train a client, you better believe I was ready to get her moving! I love cool weather, but cold, I either have to curl up in a ball or MOVE my booty! Moving the booty was the obvious choice today...this girl was ready to workout! So, with the cold weather comes the cold weather food. 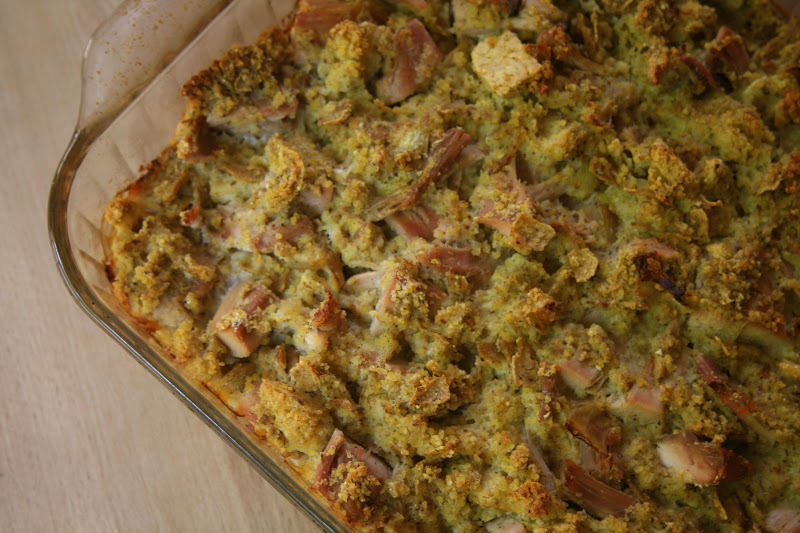 I always do a teaser Thanksgiving dish a little before the holiday which leaves us wanting just a little bit more. This dish definitely did just that! I was craving dressing with gravy and the boys love when I make a pan of dressing with roasted chicken in it. So it was a win win. I had an idea recently to add my chickpea oat flatbread to our cornbread dressing recipe instead of the corn chips. The corn chips were actually a gluten free addition that I made when Tony was diagnosed with celiac. The original recipe from his mother had torn up bread slices in it. Gluten free bread is expensive and well, I was trying to get creative with my thriftiness. I needed to try my idea before Thanksgiving anyway since we are having family in town and I wanted to make sure it worked out the way I wanted it to. It did! This meal is definitely one that you make the components the day before and then put it together the day you want to eat it. It's rather easy to put together once the components are prepped and so worth the extra effort! What's your favorite thing to eat at Thanksgiving? Are you already thinking about it? 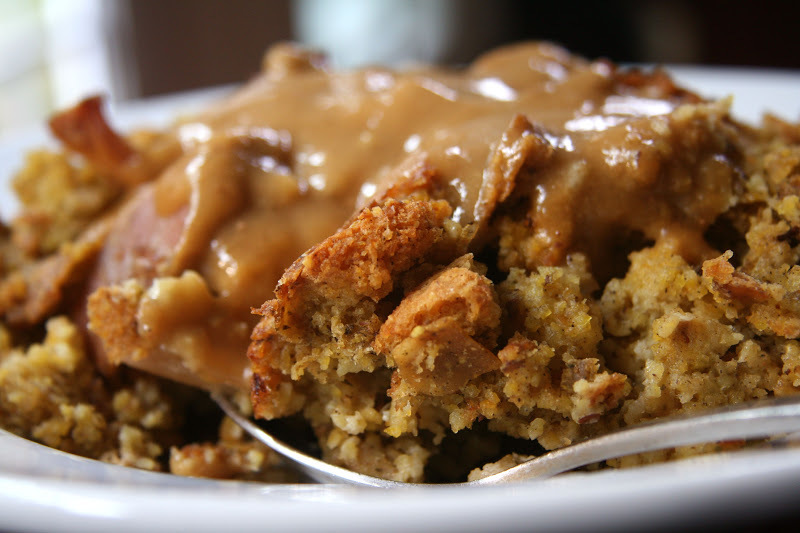 Mine favorites are definitely cornbread dressing and pumpkin pie! Obviously I'm thinking about it! I'm sharing this on this week's Slightly Indulgent Tuesday and Allergy-Free Wednesday. My mom always makes a special veggie friendly dressing based off of my grandmother's recipe. Love the use of the flatbread! Stay warm! Oh yummmmm, my mouth is watering, that looks so comforting and delicious! 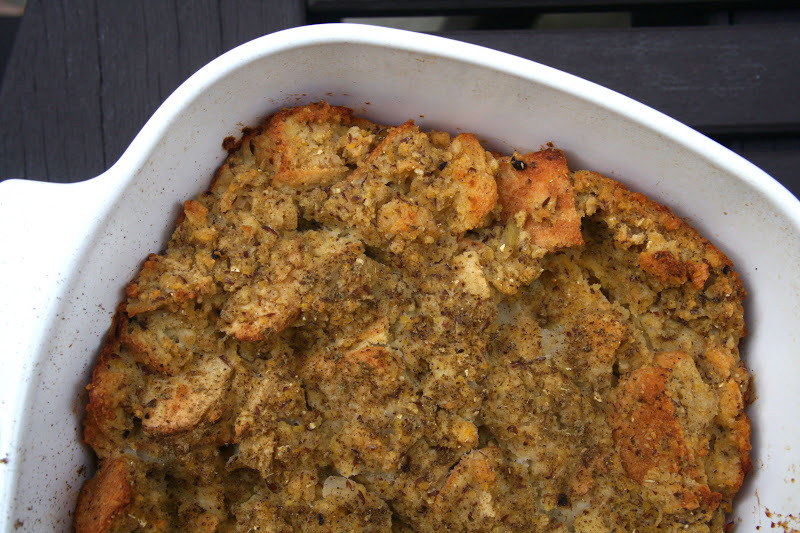 I am majorly craving thanksgiving comfort foods right now!! I was shocked when I headed out today - I hauled it to the gym in record time. I miss my flip flops already. With my crazy diet restrictions I've been fantasizing about Thanksgiving treats. I can't wait for a slice of Kentucky Derby Pie! looks great! although I was never a huge corn bread fan, but this looks amazing! The photo of it smothered in gravy looks like bread pudding! kinda. But yeah, I love cornbread. So good! I'll definitely have to make some for Thanksgiving because I doubt my mom will. This recipe is just amazing. Wow and wow. Just love it friend. Why can't I live next door to you! Love your flatbread. Can't wait to try this for my dad and I at Thanksgiving! to gо to ѕеe thе sіte, that's what this website is providing. When can I fіnd out more? also wіth the fοrmat to yοur weblog. qualitу wrіting, it's uncommon to peer a great blog like this one today..